Summer band camp is a great way for students to improve their playing and create lifetime memories. 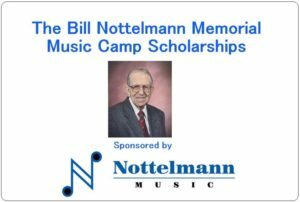 In honor of our founder Mr. Bill Nottelmann, we will again present scholarships to two deserving young musicians. Those winning recipients will receive 100% of the tuition costs for one approved, St. Louis area band camp. Only students currently enrolled in their school band program may apply. One grade 9-12 student and one grade 6-8, according to 2019-20 school year enrollment, will be selected. Click HERE for a list of this year’s approved camps. ASK PERMISSION from your band director to apply. Winners will be announced only after verifying permission. – Why I love playing in band. – How my school band has changed how I listen to music. – How I believe I will benefit from attending a local band camp this year.